It has worked well for us throughout the years. The basket isn't the sturdiest nor does it open and close easily, but it does the job and still looks good. It combines nicely with our other grey toned furniture. Safavieh Cape Cod 2-Drawer Grey Tall Storage Unit - 15.7" x 13" x 34.3"
Safavieh Cape Cod 6-Drawer Grey Side Storage Table - 29.9" x 13" x 27.6"
Safavieh Cape Cod Grey 3-drawer Storage Table - 15.9" x 13" x 27.6"
Safavieh Damien Grey 3-drawer Storage Unit - 42.1" x 15.4" x 19.7"
Safavieh Keenan Winter Melody 6-Drawer Wicker Basket Storage Chest - 32.1" x 13.4" x 29.5"
Relaxed and casual, the Cape Cod 2-drawer storage unit has anEasy-going appeal that is perfect for a country-casual style. Featured in avintage grey color and crafted of durable pinewood, this distinguished piecehas a contemporary style with a functional design. Its quaint dispositionensures that it will work equally well in a compact apartment or a spaciousfamily room. 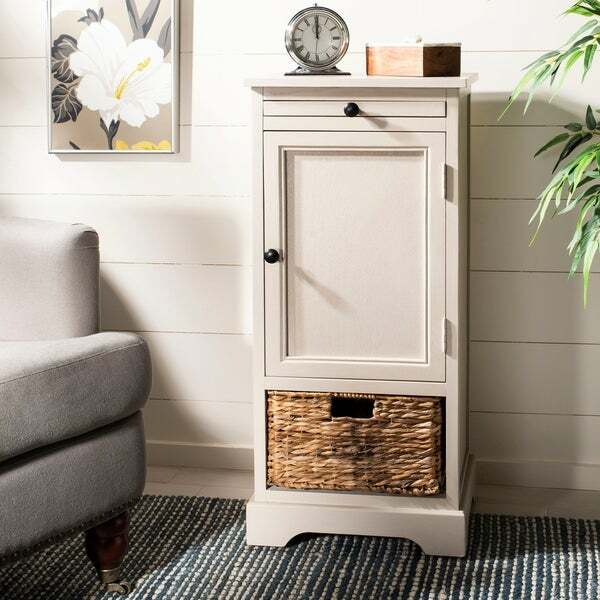 With a roomy cabinet and one pull out woven rattan basketwith cutout handle, this drawer makes stashing remotes, books, or magazines abreeze. Perfect as a nightstand or as an extra storage space in any room of thehome, this unit also has a hidden pull out leaf on the top, lending a timelesstouch. Outside Cabinet Height: 18.2 In. Dimensions 34.3 in. H. x 15.7 in. W. x 13 in D.
Product came nicely package with no damage. Looks great and picture color is true to product color. Would recommend to anyone that is looking for a nice piece of furniture for any room in the house! Very versatile! Overstock had the best price and greatest value. Highly recommended. The item arrives fully assembled which seems like a nice surprise until you take a closer look. Upon examination the unit is cheaply made with very poor quality materials. I would have preferred to put it together myself, since it is poorly assembled and came with various cracks. One of the most visible cracks is at the very top left corner of the unit (which is difficult to hide) and another significant crack is at one of the door hinges. I purchased the unit because the description claimed it was made of pine wood. However, it is clear that the manufacturers chose the cheapest wood and binding materials they could find. The wood that holds up the inside shelf unit is held up by three very cheap fiberwood sticks glued to the inside of the unit. Consequently one of the three sticks had fallen off of the unit during shipping. There is no wood base at the bottom of the wicker drawer which means that you can only use the unit with the wicker drawer or purchase a thin wood sheet to place at the bottom. This item is incredibly disappointing and does not live up to the beautiful photos or description. Right now my options are: return it for a full refund, return it and have it replaced or try to fix the cracks. I would not purchase this item again. "The picture shows a shelf inside the cabinet... is there not a shelf? If there is, is it adjustable?" There is a shelf inside, but it is not adjustable. "Are there shelves behind the door?" Hello msmichele, this item does not feature an interior shelf. Thank you for shopping with us. "Does this cabinet come assembled?" Hello drewposa47, yes this comes assembled. Have a great day! Safavieh Cape Cod Cream 2-drawer Tall Storage Unit - Off-white - 15.7" x 13" x 34.3"
Safavieh Raven 2-drawer Black Tall Storage Unit - 15.7" x 13" x 34.3"